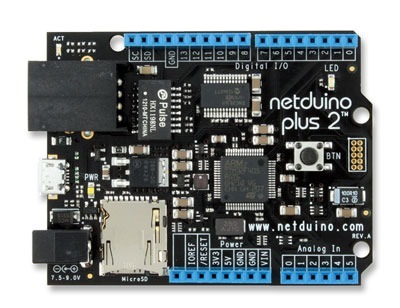 NEW PRODUCT – netduino Plus 2 (.NET-programmable microcontroller) « Adafruit Industries – Makers, hackers, artists, designers and engineers! Framework. Featuring a 32-bit microcontroller and a rich development environment, it is suitable for engineers and hobbyists alike. Netduino Plus 2 has four times the speed (168MHz), six times the code space (384KB), and twice the available RAM (100KB+) of Netduino Plus 1. This board is built to last, to get even more feature-rich over time. You might notice that we swapped out the 6-pin ICSP header for a 10-pin MiniJTAG header. The goal is to enable developers to compile their own firmware using GCC–and debug both native and managed code at the same time. If you need the ICSP header for a shield, simply sandwich a MakerShield in the middle: it’ll route the ICSP pins for you. multi-threading, line-by-line debugging, breakpoints and more. And its very expandable just like the Arduino! 3rd-party accessories offer pre-built functionality like GPS location, servo control and battery power. Netduino is also pin-compatible with Arduino shields. 3rd-party drivers are required for some Arduino shields. 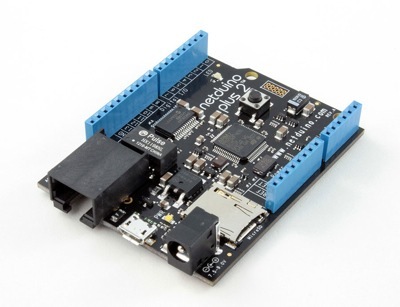 Netduino is an open source electronics platform. All design files and source code are included. Learn from the designs. Remix, and enjoy the freedom of open source. This is the sign up page, they’re on their way and should be in stock in the next week or so.